Well, it’s been a while since I’ve added a new fishing report to this site…sorry about that. I went a bit without getting any, and then with all the high water there just wasn’t much to report. But that is changing and as we get into the middle of January, it’s time to start talking again about the #1 recreational activity on Grand Lake – Fishing! Wanted to drop a quick report. The only fishing we are doing right now is for spoonbill. We are doing GREAT right now!! The spoonbill have still been staging up around the mouth of Elk River! We’ve been boating some huge males right now!! Some the males we are boating are pushing 55 pounds!! We are trolling right now with heavy weight in the river channel. 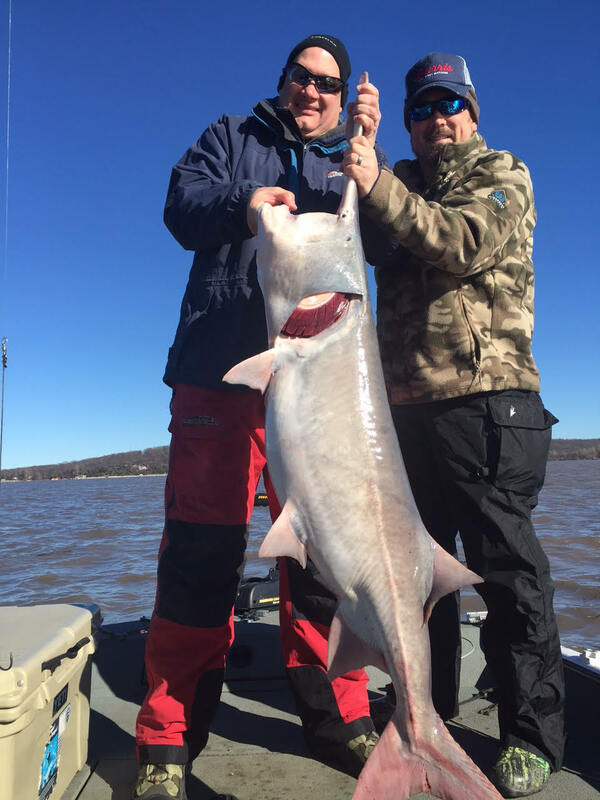 We are using 10/0 Spoonbill King hooks on 80 pound Power Pro line. If your looking for a guided trip you can call me at 918-964-0174 to setup a trip to catch a monster!! Well the flood waters are receding quickly – We actually fired guide trips back up last Saturday and fishing is fantastic! We have been boating some great spoonbill!! All the flow that has been pumping through the lake has pulled up a lot of spoonbill up to the north end of the lake and it’s been awesome! We are trolling for them right now and we have the heater burning. From Patricia Island all the way to Greys Ranch the spoonbill fishing is great!! I’m trolling 3 pounds of weight and let the boat do 95% of the work!! I’ve been seeing a lot of cats piling into the channel now that it’s getting colder. We haven’t tried them yet but I see them on the locator while we are trolling for spoonbill. We were on the whitebass in the Spring River before the flood. The flood pretty much did this bite in for a little longer. We were dragging 2 1/2″ go go minnows on the bottom on 1/4 ounce heads. If your looking for a guided trip the spoonbill action is great!! Give me a call at 918-964-0174 or go to my website www.rustypritcharoutdoors.com. Also find me on Facebook under Rusty Pritchard and look at our pics daily!